Contract Negotiation and Administration services. Better wages benefits and working conditions. A prolific Education Program which provides economical training opportunities mandated to make our members more employable. A Health Benefits Program which includes family coverage for Life Insurance, Dental, Medical, Optical, Prescription Drugs and Short Term Disability. Participation in the Canadian Entertainment Industry Retirement Plan which offers low management fees and the opportunity to retire with dignity. Exclusive Jurisdiction over various Stage, Motion Picture, Audio / Visual and Scene-Shop jobs. 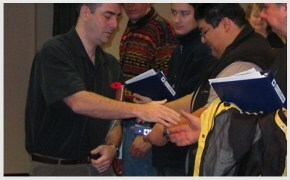 Members are hired before non-members. Membership within the largest and most vibrant Entertainment Union in the world. 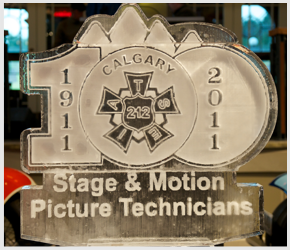 The IATSE Currently has 114,000 Members working in a wide range of crafts within the Entertainment industry. IATSE 212 is committed to helping members upgrade their skills and the IATSE 212 Education Committee updates courses on an ongoing basis. Certain courses are prerequisites for being considered for a department, and others are required before permittee status will be considered. If you are interested in registering for a course, please be sure you have submitted an application related to the course you are interested in registering for. Once your application has been received you will be contacted to complete the registration process for the course. Thank you. This is a combined course with certification on Boom and Scissor Lifts. Participants will be certified on both lifts provided they have successful completed the written and practical assessments. Certification will be valid for 3 years. Registration is through education. Introductory workshop on working in film in the Grip Department. Course will start at 08:00 am. Workshop will focus on equipment identification and job expectations. Handouts will be provided on the day. Permit applications must be submitted to IATSE Local 212 prior to registering for this course. There is currently no fee to apply for Permittee Status. IATSE Local 212 is now accepting Permittee applications for stagehands and motion picture technicians. Professional training in a specific craft. Demonstrated talent in a specific craft or related area of expertise. Understanding of the entertainment industry workplace/environment. Honesty, good character and professionalism. Copy of your Set Etiquette & Protocol card or when submitting an application advise you require the course (if you are applying to a Motion Picture department). Completed "Application for Permit Status" Form. Be sure to indicate the department(s) and position(s) for which you are qualified to apply. Should you submit an application with incomplete information or without possessing the necessary qualifications, your application will not be accepted. Applications can take up to 3 months to process. You will be notified as soon as your application has been reviewed. Please do not telephone and inquire as to the status of your application. Departments are responsible for reviewing and approving Permittee applications. It is necessary to correspond with the department in writing as there are not representatives of the individual departments in this office. Locals within the Alliance maintain "home rule" or Local autonomy. They subscribe to the International Constitution and Bylaws, but maintain local constitutions and bylaws, governing the particulars of individual Locals. Here are the basic requirements for Membership in Local 212. Be capable of obtaining employment in occupations within the jurisdiction of the Alliance. Possess sufficient experience and ability to pass a reasonable examination upon the particulars of their craft. Reside within the jurisdiction for at least 18 months immediately prior to application. If a candidate for membership meets established criteria, she/he will be proposed to the membership for their consideration at a regular meeting. If a candidate for membership meets established criteria, she/he will be proposed to the membership for their consideration at a regular meeting. The regular members of the Local, by vote of simple majority, will determine who will join the ranks as a Union brother or sister. The candidate will then complete an official application for membership which will be submitted to the International (along with an non-refundable processing fee) for endorsement by the General Secretary/Treasurer. Upon completion of this process, (which may take up to four weeks) the candidate will be initiated into the Local, pledging allegiance to the Constitution and Bylaws of the Alliance before the general membership and/or the Executive Board. At this time, a one time only initiation fee is due to the Local, along with the first quarter dues. This alone is the basis on which jobs are filled beyond the accepted industry standard of the producer's choice for department heads and Local seconds for feature films, and seniority designate department heads on general stage calls. Membership of the Local will not go to work within the jurisdiction of the I.A.T.S.E. unless authorized to do so by the Local. To maintain good standing by ensuring that financial obligations are met. To demonstrate an interest and develop an understanding of the Union's affairs by attending and participating in monthly meetings. Honor your Union brothers and sisters by conducting yourself in a professional manner in a climate of mutual respect. To promote, through collective action, improvements in the workplace for the benefit of all. Alcohol and substance abuse will not be tolerated in the workplace and are considered grounds for dismissal from the job and suspension from the calling roster. I.A.T.S.E. Local 212 offers an extensive Employee and Family Assistance Program with Homewood Solutions. Use of this program is private and confidential, the Union receives no identifying information from Homewood Solutions.